I’ve experienced this before with a pony stallion that I own as he was really frightened by the target. When I purchased this stallion he was not handled as a foal and was not halter broke so he was leary of humans. After I got him home and let him settle in for a few days I knew I needed to work towards getting a halter on him. Getting the halter on was not my first goal. I wanted to use clicker training with him so he needed to understand targeting first. When I introduced the target to him he got high headed, eyes got big, he snorted then turned and ran. Well I certainly did not want to click for that so this is what I did. I put a small ball in his pen then I went into the house for a couple of hours so he could get used to the ball without me being around. When I came back out I went into his pen picked up the ball and moved it to a different position so he would be curious about it again. Everytime he looked at the ball I would click and throw a handful of hay in his pen. It did not take him long to understand that by looking at the ball it would cause me to click and he would get some hay. 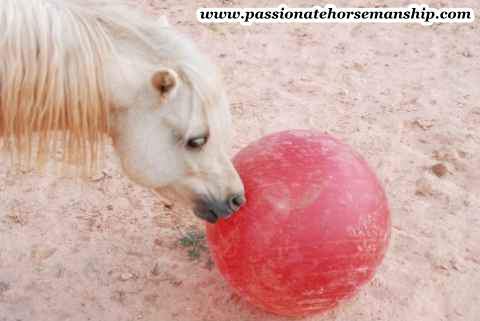 After he understood that by looking at the ball I would click and give him some hay I then started withholding the click until he would take a step towards the ball. Everytime he took a step towards the ball I would click and give him some hay. Keep in mind he was not halter broke and did not want me approaching him so I could not give him a treat by hand. After a few sessions he was touching the ball. After he was touching the ball on a consistent basis I started picking it up and asking him to target the ball. After a few days of him targeting the ball I switched to my longer hand held target. So keep in mind when you introduce the target your horse may jump back the first few times you click. I’ve found this does happen with some horses but not many. You always want to click for the behavior you want. If for some reason your horse continues to jump back every time you click when they touch the target then change to a different target. If your horse is afraid of the target you can use something they are familiar with like a feed bucket. What I do is I hold the hand held target out away from my body and when the horse looks I click then treat. Before I give them the treat I put the target either down to my side or behind me. It won’t take long for your horse to understand that touching the target will get them a reward. Just remember when starting out these things can happen so don’t get discouraged. Always take the time the horse needs instead of rushing them through the process. If you continue to have problems reach out to a professional clicker trainer to help you out. Clicker training is a powerful tool that will bring many rewards for you and your horse. Would you like help with Clicker Training your horse? Contact me today as I offer online courses so you can learn from the privacy of your own home with my help.